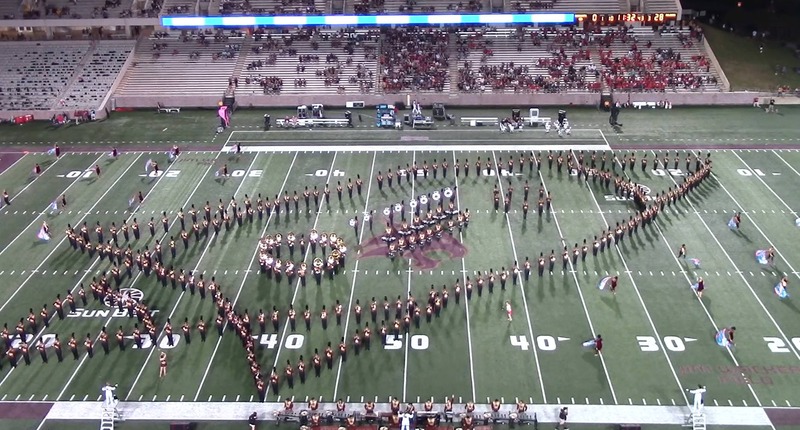 The Texas State Bobcat Marching Band is one of our favorite under the radar band programs. They get overshadowed by the other large Texas university band programs, but man oh man do they deserve to be thought of right up with the other big programs. Director Kyle Glaser has done a phenomenal job in his tenure of not only putting challenging yet fun shows on the field, but also building the band program to over 300 members strong! The show they have been working on the past few weeks has been their space show. It features music from Star Trek, Elton John, the Beastie Boys, Holst's Planets and more. One thing we love about the show is how the music is actually woven together in each set. You may be watching the band make the Star Trek symbol, but hear a passage from Holst or vice versa. It is really smart arranging. Also the sound effects are a fun addition for the fans in the stands. Enjoy this wonderful show by Texas State!